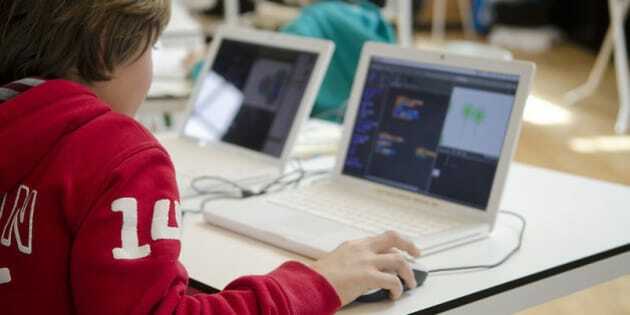 Personalized learning will mean that more often than not your child will be interacting with his/her personal computer while completing courses online. It makes so much sense to try to sell this doublespeak version of "personalized" to parents. It's so much cheaper to buy a new computer than to pay a teacher's salary year after year. Personalized learning has such a nice ring to it, doesn't it? Conjures up images of one-to-one attention, customized curricula, and care and concern for the needs of each child. It suggests that the child's learning experiences are uniquely designed, taking into account where the child is developmentally. Personalized learning will mean that more often than not your child will be interacting with his/her personal computer while completing courses online. It makes so much sense to try to sell this doublespeak version of "personalized" to parents. It's so much cheaper to buy a new computer than to pay a teacher's salary year after year. When you are a politician who believes that all that government should do is to save "taxpayers" money, this would be very attractive. It's much cheaper to buy 100 new computers for a school than to pay the salaries of learning specialist teachers. Given that the B.C. Education Plan includes the decategorization of students with special needs, an action that would render null and void the B.C. Teachers' Federation argument about class composition, one must wonder if personalized learning is more about accounting than it is about what students need. It's not just children with special needs who will suffer when a cold computer replaces a teacher's care and attention. Children who have no identified problem with learning but who do not have the ability to manage time will also struggle with the impersonal aspect of personalized learning. It's easy to miss this impersonal aspect when you look at the B.C. ED plan website. One would think that the B.C. government had suddenly changed its mind and finally agreed with teachers about student needs. But if you look closely at the key elements of the plan, you will notice that technology plays a significant role. A thorough analysis of the plan reveals that elements #1 and #5 are closely intertwined. It is the technology that will create the personal aspect. Is is the technology that will provide the "choice" as students can choose to complete some courses online. How many children do you know can successfully focus on school work for hours at a time when in front of a computer? What about those families who can't afford to provide computers or iPads for their children? Remember reading about how wonderful Distributed Learning was going to be? What happened instead was a high failure rate and students returning to school to take courses they could not complete alone at home in front of their personal computers. There is nothing truly personal about personalized learning, unless you count the personal profits that will be made through the continual sale to school districts of computers that will need to be regularly updated. One would think that this digital generation, those born into a world with the Internet already in existence, would welcome spending more time on computers. But they don't. They know that a computer cannot replace the attention of a teacher. If the B.C. Liberal government truly wanted to introduce personalized learning into B.C. public schools, they would drop their appeal of Judge Susan Griffin's ruling about class size and class composition, and would provide for public schools what private schools frequently advertise: small classes and full support for students with special needs. Providing enough funding so that public schools can offer truly personalized learning would require an investment in the public education system that the current B.C. Liberal government is ideologically opposed to, given its track record over the past 12 years. Personally, I'm not holding my breath that that investment will happen any time soon.